This Month´s Topic: Is recycling still worthwhile given the expense and emissions associated with it? Americans generate about 254 million tons of trash and recycle and compost about 87 million tons of this material, which adds up to a 34.3 percent national recycling rate. Recycling and composting prevented the release of approximately 186 million metric tons of carbon dioxide in 2013, according to the U.S. Environmental Protection Agency, comparable to taking over 39 million cars off the road for a year. Aluminum cans are currently recycled more than any other beverage container in the U.S, which is good for business and the environment, says the Aluminum Association, because making a can from recycled aluminum saves not only aluminum but 92 percent of the energy required to make a new can. A 2015 analysis by the Aluminum Association and the Can Manufacturers Institute determined that if all of the aluminum cans in the U.S. were recycled, we could power four million homes and save $800 million per year. Aluminum cans are also the most valuable to recycling companies, with a value of $1,491 per ton compared to $385 per ton for PET plastic. “Cans are recycled at the highest rates, and drive recycling programs across the country because of the high value of aluminum compared to other packaging materials,” said Heidi Brock, President and CEO of the Aluminum Association. 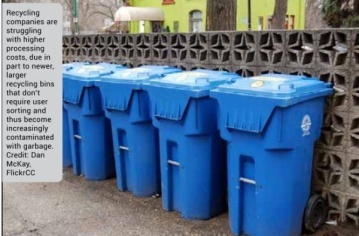 In recent years, however, recycling companies are struggling with higher processing costs, due in part to newer, larger recycling bins that don’t require user sorting and thus become increasingly contaminated with garbage. In a 2014 survey by the National Waste and Recycling Association, nearly one in 10 Americans admitted to throwing their waste in recycling bins when trash cans were full; one in five said they will place an item in a recycling container even if they are not completely sure it is recyclable. “People refer to this as ‘wishful recycling,’ that’s just when in doubt, put this in the bin because there’s an outside chance they might be able to recycle it,” Delvin notes. “So you see Styrofoam. You see PVC. You see batteries and those types of things….” This mixing of waste with recyclables, he says, makes it very difficult to extract the true recyclable commodities that are there that have value. Improved education regarding the proper materials to recycle is needed to allow recycling plants to remain economically feasible. The pros and cons of recycling are heavily debated, but there’s never an argument over the environmental benefits of limiting disposable packaging and utilizing more durable reusable goods, like shopping bags, coffee thermoses and water bottles, to name a few, in daily life. CONTACTS: Aluminum Association, www.aluminum.org; Can Manufacturers Institute, www.cancentral.com; Green Is Good Radio, www.greenisgoodradio.com; National Waste and Recycling Association, www.wasterecycling.org; ReCommunity Recycling, www.recommunity.com.